For those of you contemplating travelling to the UK from Croatia by car, for the first time, there are a few things you need to know. Following in Austria's footsteps, Slovenia decided to introduce a vignette system earlier this year. Though Austria's €8 for a 10 day vignette originally seemed a little expensive for not more than a couple of hours of motorway, it now seems excellent value for money compared to Slovenia's massive €35. This is "justified" on the basis that the minimum period is 6 months but it's patently obvious that it's just a racketeering scheme to extract money from tourists taking the through route. Adding insult to injury is the fact that Slovenia's roads, particularly the through route, are so diabolically poor. The "motorway" that takes you to Austria's excellent roads lasts for about 10 minutes and before that it took us 2 hours to do 20 kilometres through Maribor, on a pot holed single lane road, that had roadworks in the middle, forcing it into just one lane for two traffic flows from opposite directions. Slovenia has had billboards around for some time saying it's improving its roads. By the time it gets around to it, we expect them to be able to afford to pave them with gold! With a decent map and the Michelin route planner it's all pretty straight forward as long as you have the main towns you are heading to firmly in your head (and it pays to remember a few of the smaller ones too). The one exception to this seemed to be Liege in Belgium, where we were expecting to see a sign to Brussels but saw everything else but, and made a couple of lucky and adrenalin filled last minute guesses at the motorway intersections. So just to be on the safe side, work out where you're not heading to as well, when you get near Liege. If you want some easy night driving, do it in Belgium. The motorway surface is not as good as elsewhere but, until you get near the coast, the motorway is well lit pretty well all the way. Yes it's fun to amble around the country side and discover hidden gems but if your mission is to get home as quickly and as rested as possible then it's hard to beat the motorway hotels in Germany at around €59 per room. They're almost invariably accompanied by a decent restaurant, bar and other facilities, and normally have modern, clean, functional and relatively spacious rooms. You can tell which country you're in by the general demeanour of the drivers, as well as the marked change in landscape. Croatia's motorway is notable for its stark mountains, empty motorways (unless you pick the wrong weekend) and mostly foreign drivers, particularly in summer. Slovenia is notable for its bad roads, traffic jams and extortionate vignette. The demeanour of the drivers I would guess is very patient! You know you're in Austria by the sudden change to lush green scenery and faster drivers but not too much in the way of congestion or lorries. The roads are particularly good - marked by an absence of roadworks and a long tunnel that takes you swiftly and painlessly underneath the large town of Graz. Germany, particularly as you head further into it, is the real challenge and you need to decide whether you want speed or relaxation. Most of the motorways are just two lanes and full of lorries (no tolls as in France for example), and though maximum speed limits have now been introduced, many Germans still live in the good old days of no limits. So you need enormous concentration over several hundred kilometres and spend as much time looking in your mirrors (for a car that's come from nowhere) as you do looking forward (amongst other things to judge, when you need to pull out to avoid getting boxed in behind a concentrated lorry convoy). Scarier still are the roadworks around Frankfurt - narrow lanes with walls on either side - if you stay on the inside lane you'll be stuck at slow speeds for a long time; if you dare to pick the outside lane you'll be going faster than is comfortable with a lorry 6 inches away on one side and a metal or concrete wall 6 inches away on the other side! So it's a relief to get into Belgium where drivers seem sedate compared to their German cousins, and what was a slow speed in Germany now seems to leave everyone standing. Today's photo is of the roadwork sign in Maribor, Slovenia. By the time we reached it we had been stuck in a traffic jam for an hour and a half - no accidents; just roadworks. Dog (and cat) lovers in Croatia will be pleased to know that there is an organisation in Osijek called "Life" that is making great strides into animal welfare and doing more than its fair share to find homes for stray and abandoned dogs and cats. We know as well as anyone, what a big responsibility dog ownership is but it is immensely rewarding. If you are living in Croatia and can honestly take on a dog or cat "for life" then why not consider offering a home to one of "Life's" residents? If you can't take on a dog or cat then perhaps a donation to assist with the work done by the organisation? Full details, in English and Croatian, are on the website - http://www.zivot.hr/. We've had some mostly very postive feedback from our last posting on the problems of staying "legal" in Croatia. For those who want to see exactly what the current law says, go to http://www.mup.hr/1266.aspx. However, moving on from the legal quagmire, we were contacted by Oliver Komadina, a native of Split who is currently studying in Germany. Oliver has solved his home sickness problem by blogging about Split and has built an impressive site with plenty of helpful facts, tips and information. Go to http://www.split-guide.com to read more and many thanks to Oliver for getting in touch. Today's photo is of Split's sandy beach, Bačvice. Croatia Online - Stunning Sunsets And False Dawns? Croatia Online started two and a half years (and 222 posts) ago as a hobby, an outlet for a yearn to write, and a forum to share the exploration of a bountiful and hitherto relatively undiscovered country, warts and all. We inaugurated with a regular pattern of news, business research, destinations and, of course regular reviews of the latest in tourism news. Croatia Online has evolved, as has Croatia. Very occasionally, we may have hijacked this site with a little self promotion in mind, but essentially Croatia Online remains our forum for free writing on a subject that has been endearingly easy to write about, and displays very few "warts". It has also allowed us to make many good friends along the way – fellow expats and Croatians. Free writing on Croatia Online hasn’t been quite so much fun lately and we’re conscious of ever increasing gaps between posts. That’s partly down to pressure of work, irritating examples of outright plagiarism, occasional instances of “competitive rivalry” going a bit too far for our liking, but mostly down to a recent questioning of our roots and whether we are being completely honest with our readers. Croatia is right to be proud of its natural and cultural heritage, and the independence it fought for so resolutely, at great cost. Croatia is a nation state that can choose its destiny - dare we suggest that Croatia will be judged as much by the journey as the destiny itself? It's our experience that this year’s journey is proving a little bumpy and circuitous for a number of reasons. It’s easy to criticise a host country that isn’t your own and a great discourtesy without good cause and a great deal of thought. Throughout our time in Croatia we’ve endeavoured to adapt as far as possible, and find most of the cultural differences extremely refreshing. As we’ve said several times, the vast majority of Croatians we’ve met have been courteous, kind and helpful – perhaps not always as warmly welcoming as we might like but generally full of integrity. However Croatia is a country in transition and we very much hope that the transition pains are not, as they currently appear, felt too strongly by those foreigners who hope to spend more than just a couple of weeks holiday in such a beautiful country. Croatia acknowledges openly its dependence on foreign tourists but even in this important area there are small signs that it might be beginning to sell its soul. In some parts of Croatia, drink and food prices have risen steeply for this year’s tourist season, parking appears to have become a “get rich quick scheme” for some with whole towns installing barriers and hourly rates rising sharply. The number of quality hotels has increased dramatically in recent years but the rates, in many cases, compare with a more developed Western Europe, and the five star service that is implied with the price is not always quite what it could be. Eastern Europeans, always very faithful to Croatia for good value apartment/beach holidays, were told peremptorily, earlier this year, that they could no longer bring their own food and drink with them as Croatia had decided to follow the relevant “EU regulations”. They cancelled their holidays en masse, to the surprise of the authorities, who promptly U-turned and decided Croatia would not be following EU regulations in this respect. Fine that Croatia is developing a strategy towards a better class of tourism but that can’t happen overnight and without some warning. Until the strategy and infrastructure is fully in place there’s a great risk that elite travellers will find their expectations are not met, visitors on a tight budget may find eg Bulgaria, Romania, Spain, Greece and Turkey more attractive and welcoming, and the “average” traveller will be caught between Croatia’s two stools. For those that have chosen to live and/or work in Croatia, the year has been bumpier still. New laws introduced in January mean that owning a property no longer counts as one of the good reasons for a stay of longer than three months, or six months in any one year. So what happens to those that have sold up in their home country and moved lock stock and barrell to Croatia? Those that were advised to buy a property through a company, by the vast army of estate agents (foreign and local) that jumped on the rising property market bandwagon, are now met by silence when asking for advice on just how to cope with the new regulations on foreign owned companies used to purchase the property – the need to employ Croatian staff and invest a substantial amount of money in the company. And those foreigners running so far legitimate businesses in Croatia have been hit with the same sudden law changes and the likelihood that their business visa, allowing residency in the country for longer than three months, amongst other things, may not be renewed. Foreign owned estate agents have also been targeted with the requirement to pass an exam, in Croatian only, after an expensive course only available in a couple of cities. Fair enough one might say – there’s a need to control rising property prices, rogue estate agents, companies that are essentially shams and excessive immigration, but are sudden and draconian law changes, so obviously targeted at the very foreigners that have, on the whole, been partly responsible for Croatia’s ever improving economy, the way to do it? And is the feeling engendered – effectively that foreigners' money is welcome but foreigners are not – a healthy one for a country that relies, to a certain extent, on foreign investment and tourism, and is hoping to join the EU? This posting is not written lightly but comes from increasing feedback from a number of friends, contacts and colleagues that suggests, even with the best will in the world, it is becoming increasingly difficult to stay on the right side of the law in Croatia. Speaking for the fellow Brits we know, 100% of whom have grown up with respect for the law, whatever country they are in, for many it’s become an untenable situation. Some feel compelled to leave, whether or not they can realise a break even price for their property, or regardless of the fact that they have to start their business all over again somewhere else. Increasing and normally uncompromising inspections on property ownership, planning permissions, property letting and businesses, seem to be targeted mainly at foreigners. The Croatians we’ve spoken to seem used to law making that can be impossible to follow, and are generally left alone in their more practical interpretations of it. Foreigners risk losing their biggest investment – their property and/or their business, massive fines, and the threat of expulsion and a criminal record. All very unsettling though perhaps worst of all is the common complaint about how difficult it is to get hard information and facts. Whilst the government is not helping to make foreigners feel welcome with its new focus on foreign residents and foreign owned companies, it can’t take all the blame: this is the first year that we’ve witnessed a number of nationalistic attacks, mostly verbal, on foreign registered cars and foreign visitors. It’s still very much a rarity but not a trend for the better, and this is also the first year that we’ve had consistent reports that certain parts of Dalmatian are more expensive than London …and it’s true! The Croatian tourist board has, for some time, used the slogan “The Mediterranean that once was”. Change is inevitable, but increasing word of mouth reports from tourists and longer term foreign residents alike, that they don’t feel welcome in Croatia, or that it no longer provides value for money, or that it is becomingly increasingly nationalistic and diverging from Europe rather than converging, could, if not addressed, lead to a more apt slogan of “the Mediterranean that could have been”. Certainly the advantages of the Croatian Tourist Board’s massive spend on advertising could soon be wiped out by increasingly negative dinner table conversations, amongst foreigners wondering how to sell their properties and find a country that is happier to take their money. What would we do if we were “king”? 1. Recognise that existing foreign home owners generally invested and continue to invest in Croatia abundantly and in good faith, encouraged by the authorities and abetted by locals cashing in on Croatia’s popularity as a dream "place in the sun destination", sometimes at hugely inflated prices. Help them to meet reasonable demands and reasonable and transparent law. 2. Recognise that small entrepreneurship, foreign or domestically owned, is the lifeblood of a strong economy and should be welcomed. Yes companies should follow certain basic rules and pay their taxes, but make the law friendly towards businesses of any size that are contributing to the economy – from little acorns…..
3. Announce a general amnesty for already established foreign owned companies, and foreign property owners and long term residents, to enable them to continue living and/or working in Croatia providing they meet the same basic requirements as before, and are paying reasonable and proportionate dues. Perhaps even a transitional period and assistance to meet stricter but still reasonable requirements so they have time to decide whether they have the will and the means to remain in Croatia. Currently many people feel they are as good as being expelled, at short notice, by default. 4. Provide transparent and clear rules for newcomers to Croatia that explain the steps for buying a house or setting up a company, or working in Croatia, or residing for longer than three months. If people know what the rules are before they invest, and the precise steps to meeting them, they have a free, informed and fair choice before making such an important decision. 5. Provide expert specialist advisors, perhaps listed on a government website, who are consulted by the government on prospective law changes affecting foreigners, and understand them sufficiently to be able to give clear information and advice. 1. To holiday makers – Croatia is still a great place for a holiday but it’s best to stay away from the best known tourist centres – Hvar, Trogir, Dubrovnik, etc - in the high season if you are travelling on a budget. 2. To all readers – apologies for the rather sombre tone of today’s posting. Unfortunately, it was a matter of conscience but we hope that now the subject has been aired, we can carry on enjoying the best of Croatia, hopefully within the “foreigner friendly environment that once was”. 3. By coincidence, today’s posting coincides with Croatia’s Victory Day or, more correctly, the "Day of Gratitude to the Homeland Defenders". Today marks the 13th anniversary of Operation Storm, the military offensive launched in 1995 and led by General Ante Gotovina, to recapture territory held by rebel Serbs for four years. We hope that, as well as enjoying the bank holiday and celebrating its freedom, Croatia can look forward to ever better relationships with its foreign neighbours, near and far. 4. To Croatian readers and friends – it has been a source of great comfort, in the past, to know that bureaucracy and “sledge hammer to crack a nut” legislation affected Croatian and foreign individuals equally alike. This doesn’t seem to be the case any longer and this posting is prompted by the strength of dejection amongst a number of our good expatriate friends here, and just a little depression ourselves. We know other countries, including our own, can be pretty difficult places for foreigners but feel that the recent trend in Croatia is disturbingly and increasingly negative. That's compelled us to air these issues in the hope that it will encourage a little debate, for the sake of honest blogging, and in order to move swiftly on. 5. As we’ve said before, if it was too easy, everyone would want to live here! 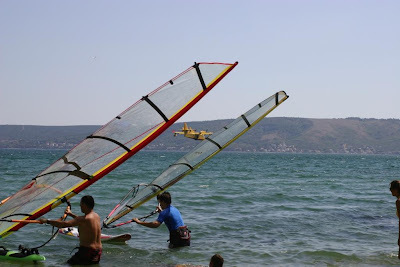 Today’s photo appeared with our first posting, back in January 2006, and features a fire plane, framed by two windsurfers, landing on the sea by Kaštela on a sunny day, to pick up more water to put out a bush fire – our best endeavour to find an image depicting a variety of the earth’s sometimes conflicting elements!